As I slide out of the shallow basin and drag myself past the top edge of the drop-off, I find myself hovering in an empty void. Between me and the rock plateau far beneath me, I seem to have nothing but a clear space. It is almost disturbing. Aside from the feeling of drag when moving, it is almost impossible to detect the water we are in. Only the rising stream of bubbles from the air we exhale, gives any indication that we are indeed well submerged in some of the clearest water on the planet, if not the clearest. Visibility just seems endless, almost like air, making long distances difficult to judge. In essence, we are diving in the part of the crack that opens up between America and Europe as the continents drifts apart. The cracks and adjoining lake are filled by meltwater from glaciers some distance away, which passes through the porous underground and gets further micro-filtrated in the process. Apparently, there is nothing left in the water, but water. There is an almost magical blue hue over the scenery that could be taken out of science fiction movie. It looks like we are on some foreign moon. In our drysuits, our similarity with astronauts is not too far off either. Cracks, crevices and holes are here and there—all over the place. Historically, this place has special significance. Major events in the history of Iceland have taken place here. It was at Thingvellir—which literally means “Parliament Plains”—that the Icelandic general assembly was established around 930 and continued to convene there until 1798. Today, Thingvellir is a protected national shrine. According to the law, passed in 1928, the protected area shall always be the property of the Icelandic nation, under the preservation of the Alting, the Icelandic parliament. Thingvellir was declared a national park in 1930. Preservation measures at Thingvellir were modelled on the national parks that had been established somewhat earlier in the United States to stem changes to the natural environment there resulting from encroachment by settlers. Iceland identified a similar need to preserve certain natural and historical sites for future generations to enjoy them in their original state. In the last few decades, research has made it clear that Thingvellir is a natural wonder with the geological history and the biosystem of Lake Thingvallavatn forming a unique entity. Being able to witness the evolution and formation of new species in a place like Lake Thingvallavatn is of immense value. The cracks and canyons in which we are diving, seem devoid of life almost sterile, though the lake body that they lead into seems different. 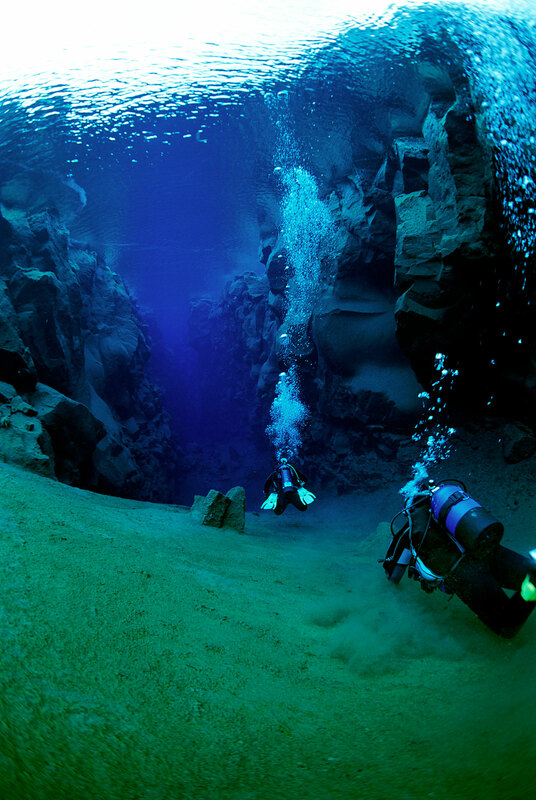 It is not the lake but these amazing canyons that are the points of attraction for divers who come to Iceland. Why? I guess the images give the best answer. The first time I saw an image from Thingvellir was when I was a young diver in the 1980s and saw a promotional poster from Waterproof by Göran Ehlmé, which featured Thingvellir. It was a classic dive poster that adorned walls in many dive clubs around the country at that time, but it made a lasting impression. Our main travel feature in issue #24 is North Sulawesi where Wolfgang Pölzer visits Bunaken and Lembeh. Harald Apelt takes us to another Mediterranean pearl, the picturesque little port town of Kas in Turkey, while Arnold Weisz takes another dip in Brazilean waters by visting Ilha Grande, the resort island with no cars. Arnold also writes about the coral trade. Kurt Amsler shows us how to make great black and white images but, more importantly, he continues his mission to save the seaturtle from illegal hunting in Indonesia. Our new dive doctor, Kevin Chan MD, from Singapore writes about diving with asthma. In our new column, GirlDiver by Cindy Ross, we find out where the girls are. This issue's unique dive site is Lake Thingvellir on Iceland, and the portfolio section features painter Jens Poulsen of Denmark.